The Countryman E6 directional wireless earset is an unobtrusive, world-class mic that delivers high-quality voice pickup while rejecting surrounding noise and feedback. 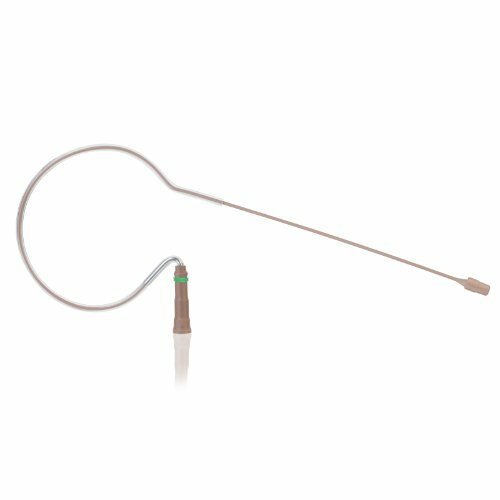 An ultra-miniature mic element is held close to the mouth by a thin boom and comfortable earclip for world-class vocal mic sound with far better isolation than an omnidirectional mic can provide. The entire assembly weighs less than one-tenth ounce and almost disappears against the skin, so performers can forget it’s there and audiences barely see it. Excellent for singing and spoken word applications. Extremely popular in houses of worship, theater and outdoor settings. Directional version is ideal for situations with loud monitors, extreme feedback or environmental noise. Bendable boom custom fits every wearer. Hands-free, wireless-enabled mic allows total freedom of movement. Rugged and reliable, virtually unbreakable steel boom. Stiffer boom is easily adjusted yet holds its shape, making it perfect for single-wearer applications. Exclusive quick-swap cables for field replacement or compatibility with various wireless systems. Extremely resistant to sweat and water. Fits Sennheiser transmitter models Evolution series, EW100 (G2/G3), EW300 (G2/G3), EW500 (G2/G3), SK 1093 and 3.5-mm locking connector. Includes 2-mm Duramax aramid-reinforced cable. Features standard gain sensitivity for general speaking and classic/springy boom. Available in tan color. If you have any questions about this product by Countryman, contact us by completing and submitting the form below. If you are looking for a specif part number, please include it with your message. Mogami GOLD DB25-XLRM-05 Analog Recorder Interface Cable, 8 Channel, DB25 to XLR-Male, 5 ft.